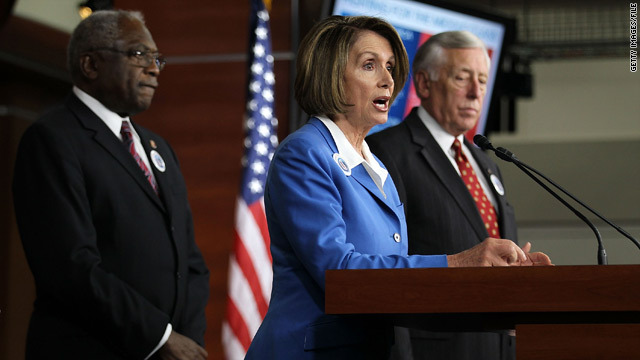 Nancy Pelosi will be minority leader, Rep. Steny Hoyer (right) minority whip and Jim Clyburn (left) "assistant leader." (CNN) -- House Speaker Nancy Pelosi has struck a deal that ends the leadership fight for the number two slot in the new House minority, multiple senior Democratic sources tell CNN. Under the compromise, current House majority leader Maryland Rep. Steny Hoyer will become the Democratic whip, which will be the number two spot in the new Democratic minority. South Carolina Rep. James Clyburn agreed to end his bid for that spot and instead hold a new, third-ranking leadership post that will be created for him. In a letter to Democratic colleagues on Saturday, Pelosi said she plans to designate him "Assistant Leader." In a statement Saturday, Clyburn -- an African-American -- said it was important that the party's House leadership represented "the diverse views, backgrounds and experiences of our membership." The new structure, he said, "honors the diversity and fosters the unity" of House Democrats. "I believe this resolution allows us to begin the journey back to a stronger and more resilient majority," said Clyburn, the current majority whip and a congressman since 1993. Will Rep. Shuler challenge Pelosi? When the Democrats become the minority party in the House they lose the position of Speaker, a shift that left Hoyer and Clyburn jockeying for the House minority whip position. Hoyer also released a statement Saturday, saying he would look forward to serving as the Democratic whip. "Since the election last week, I have made clear my belief that it was important for my friend Jim Clyburn to continue serving our Caucus as the third ranking member of our Leadership," he said. The deal allows Rep. John Larson of Connecticut to keep his post as Democratic caucus chairman and Rep. Xavier Becerra to remain as the vice chair of the Democratic caucus. Speaker Pelosi revealed the deal in a somewhat cryptic statement late Friday night. "Should I receive the honor of serving as House Democratic Leader, I will nominate Congressman Jim Clyburn of South Carolina to the number three leadership position," Pelosi said.